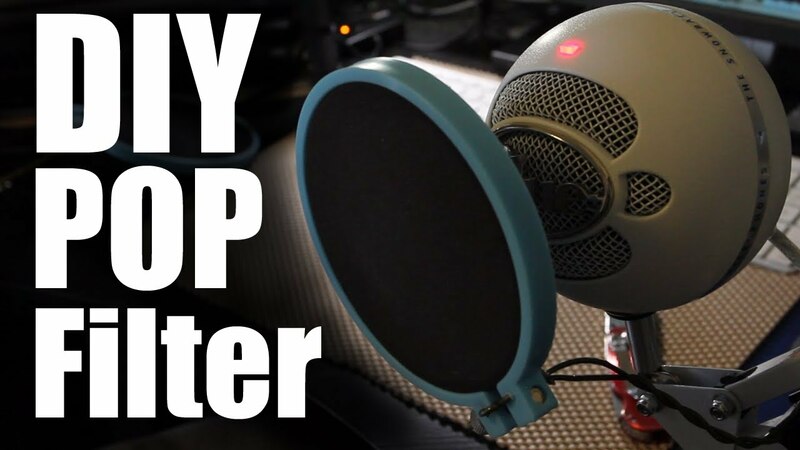 Are pop filters really essential? Imagine how live studio productions will be like without the microphone filters – dull, ruined by loud popping and banging noises. These can be more disastrous when it comes to studio recordings. Even the best singer still get microphone popping occasionally. Such disturbing noises are not present when you speak normally. This is the reason why you need a pop filter or pop shield. It is an anti-pop noise protection for microphones, importantly used in a recording studio. One of the most vital duties of a pop filter is to reduce or remove popping sounds. This filter keeps moisture off the microphone as well. The pop filters are not only good at keeping the show away from destruction; they are also good in protecting saliva accumulation on the mic element. Pop filters are very much important, aren’t they? Every recording studio must have one to produce really great sound. You do not have necessarily need to buy and spend a lot of penny just to have microphone pop filters that work. You can simply do it by yourself. Here is how. You need an embroidery hoop. It’s a plastic and comes in different colors and sizes for you to have some fun and be creative while making your own pop filter. The 6 inches embroidery hoop is ideal because it is about the same size with the manufactured one so it would be better when it comes to the battle between you and the microphone. Prepare the pop filter materials: hose, pantyhose or nylon stockings, Romex wire that comes in a variety of different gauges. Attach the wire to both the hoop and your microphone stand. To do this, you need a zip tie and a hose clamp. The size of the zip tie and the hose clamp will depend on the dimension of your microphone stand and the hoop that you buy. You can also have a split loom conduit flexible tube that you can split around your Romex wire but this is optional. Make the look a little bit nicer by getting different colors. Attach the hose clamp to the microphone boom stand. Don’t forget to remove the microphone cradle first. Tie this a little bit so you can be ready for the Romex wire. Right after the assembling of the clamp to the microphone stand, the next would be the embroidery ring and the nylon material. Cut the ends of the stocking legs. You can make a nylon tube right after. Put your hand inside to make it stretched. Cut the slit of the nylon material down on the sides. What you will be seeing next is a plain sheet of nylon. Then fold the nylon so you can insert the ring. While you’re stretching the nylon on the table. Let someone slide the inner embroidery ring underneath the material. Make sure the nylon completely cover the entire inner ring. Then let someone place the outer ring on the covered inner one. Snag up the inner and outer ring to hold the nylon material in place. Cut the excess nylon material by pulling on the nylon just a little bit. To make a very nice clean cut on the back of the hoop. Attach the Romex wire to the back portion of the hoop. Remember, the front side is the clean and neat portion of the hoop while the back is where you cut the excess nylon. To do that you have to slip in the zip tie first, tight it down enough to get over the screw on the ring. Then slip in the Romex wire, you can adjust the wire to get the best position then tight down the zip. The zip tie should be pretty tight to hold the wire and stand on the back of the camera. Attach the end of the Romex wire then to the microphone stand. Figure out the orientation of your pop filter depending on what you think is best. What you need to do now is to bend the wire to get into the boom while covering your microphone. You can use pliers for easier bending. Make sure the mic is free from any obstruction. Slide the end of the wire into the hose clamp. Don’t forget to tight down the clamp pretty hard. Then take your split loom conduit flexible tube and slide this over the wire. This will make the wire look prettier. Try to speak on the mike, the pressure of the air hitting the diaphragm of the microphone. It is not good for the recording or the microphone either. Now, try to speak very close to the pop filter, the result would be pretty nice. This is because the nylon layer breaks up the air pattern before hits the diaphragm of the microphone giving you a lot better recording experience. The bottom line is you can make your own pop filter inexpensively. If you have to replace or repair any piece of the filter you can do that with ease without much cost. These tips are very much easy and simple yet it is very effective when it comes to filtering the loud pop and bang noises. Don’t rely on manufactured pop shield; you can make it by yourself!